Hardcover, 10.5 x 12.5 in. / 120 pgs / 80 color. 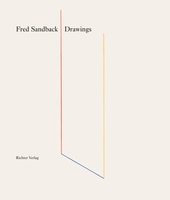 This new publication marks the first comprehensive survey of a seminal body of work that helped make Fred Sandback (1943–2003) into an internationally celebrated artist. This catalog takes its lead from a 1987 presentation of Sandback’s work at Westfälischer Kunstverein in Münster, also called Vertical Constructions. With a mixture of archival imagery of the sculptures in situ in Münster, new photography of these works installed at David Zwirner in 2016 and an expanded selection of sculpture, this publication is both a historical document and a source for the renewed attention to this body of work. 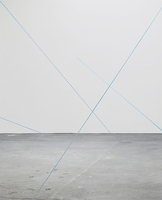 Scholarship by Yve-Alain Bois revisits the power of Sandback’s immateriality in the context of the vertical constructions while Lisa Le Feuvre, a longtime scholar of sculpture, offers a more historical treatment of the show in relation to the artist’s writings and other works from the 1980s. 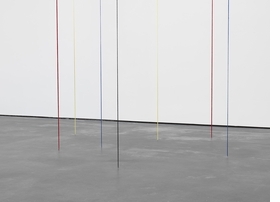 Fred Sandback (1943–2003) was an American artist known for sculptures that outlined planes and volumes in space. 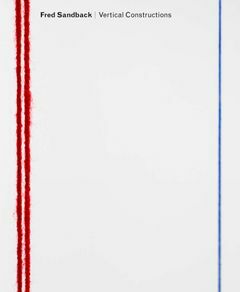 Though he employed metal wire and elastic cord early in his career, the artist soon dispensed with mass and weight by using acrylic yarn to create works that address their physical surroundings, the “pedestrian space,” as Sandback called it, of everyday life. 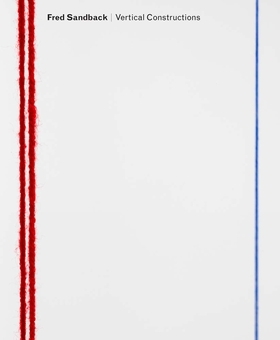 By stretching lengths of yarn horizontally, vertically, or diagonally at different scales and in varied configurations, the artist developed a singular body of work that elaborated on the phenomenological experience of space and volume with unwavering consistency and ingenuity. Yve-Alain Bois is a professor of art history at the School of Historical Studies at the Institute for Advanced Study in Princeton, New Jersey. Bois has written widely on modern and contemporary art, and his 2005 essay on Sandback’s work has remained one of the most influential pieces of scholarship on the artist to date. Lisa Le Feuvre is head of sculpture studies at the Henry Moore Foundation. Le Feuvre has taught at numerous academic organizations, including Chelsea College of Art, Goldsmiths, Royal College of Art, Sotheby’s Institute of Art, San Francisco Art Institute, and Städelschule, among many others. David Gray is an editor and art historian. He is presently a board member at the Fred Sandbank Archive; project director, Robert Ryman Catalogue Raisonné; and executive director, The Greenwich Collection, Ltd., a nonprofit foundation. 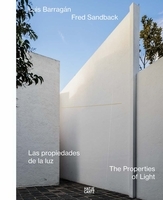 He has contributed to catalogues raisonnés for John Cage, Dan Flavin, and Felix Gonzalez-Torres. Interestingly enough, by then Sandback had, in fact, realized a work outdoors, and he had made preliminary drawings for two other outdoor projects. 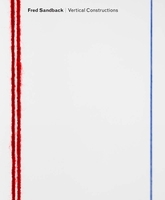 Both the finished project and the first of the two unrealized concepts could be categorized as “landscape designs.” Both date from the artist’s early career, a time when, arguably, Sandback had not yet definitively pared down his preferred means of expression to the colored straight lines extended in space for which he is best known today. The finished project, part of the 1971 exhibition Sonsbeek 71 in Arnhem, The Netherlands, consisted of a bed of salvias planted within an interstice of a network of pathways in a park. Of the two unrealized endeavors, the first comprised a planting of buttercups and would have occupied a large area in Prospect Park, Brooklyn, near where Sandback was living at the time, in 1970. The second, dating from 1978, is of a different kind, more in keeping with the work Sandback has accustomed us to, and it involves architecture—one could even say that it is not, sensu stricto, an outdoor project. The plan was to have a horizontal line cross the vast courtyard of Castle Clinton, a 270-degree enclosure (three-fourths of a circle) open to the sky in Battery Park, at the southern tip of Manhattan. Why the project was abandoned is not known. It might have been just the usual bureaucratic red tape, but I am inclined to think that Sandback felt that it would not work—that the architecture was too peculiar to function as an anchor, that its scale would dwarf his line and prevent it from activating the space, and that both conditions would condemn the piece to invisibility. Or could the problem have been the rooflessness of the partial ring? Is a roof or ceiling an essential condition of Sandback’s work? Obviously it is, materially and physically, considering his many works in which lines are tensed between floor and ceiling—including all the Vertical Constructions. So materially, physically, yes—but what about spatially? And visually? The answer is less certain. 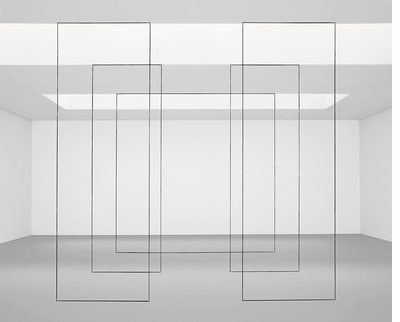 Visually, I do not think that the ceiling per se has much more relevance in the Vertical Constructions than in many other pieces in which Sandback’s lines are not connected to the top of a room. In fact, it is my experience that the Vertical Constructions work better when the ceiling is so high that it is not within my visual field when I stand upright and look straight ahead. I know it is there, and I know that there is some sort of cover (or at least some horizontal support), for otherwise the lines could not be tensed, but I gain no satisfaction in observing that cover, and no further insight into the piece. I still look up to check (call it professional habit), but all it tells me is: the upper boundaries of Vertical Constructions come in different shapes. Most often it is the flat ceiling of a proverbial white cube, but many times it is not, and this does not matter all that much, if at all. FORMAT: Hbk, 10.5 x 12.5 in. / 120 pgs / 80 color.